No wardrobe is complete without a white t-shirt, indigo jeans, and a pair of sunglasses. Across the world there is one eyewear brand that is most well known, most recognizable, and most mimicked. When you see them you might not be able to read the signature on the lens' corner, but you know what it says: Ray-Ban. Before Ray-Ban, American pilots wore goggles that resembled those worn by scuba-divers. Aviator and Air Service veteran John Macready reached out to Bausch & Lomb for help designing spectacle-like eye protection that would tame the sky's blues and the sun's brilliance. In 1937 B&L released the green-tinted anti-glare Ray-Ban Aviator. 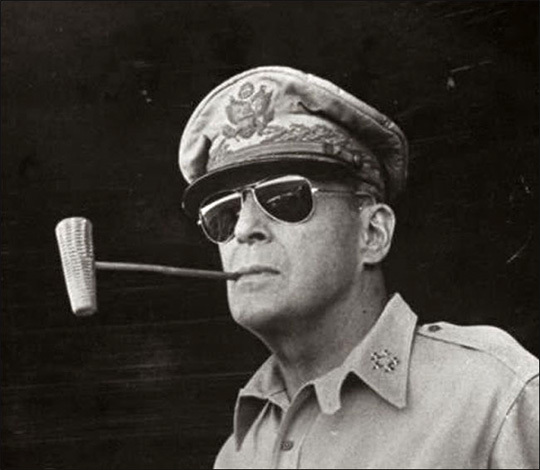 Immediately popular in the military, the larger public first saw the Aviator sunglasses when newspapers printed pictures of General MacArthur landing in the Philippines. During the '30s and '40s Ray-Ban developed the Outdoorsman and the Shooter for non-pilots. Further research at the time resulted in gradient and mirrored lenses, favored in World War II for their protection and utility. 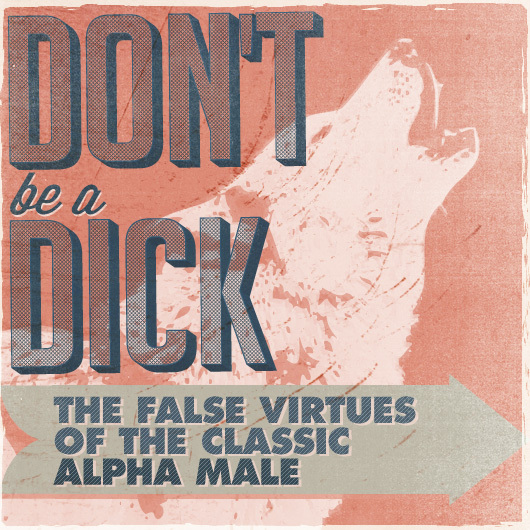 The '50s introduced passenger jets, Rock and Roll, and the Ray-Ban Wayfarer. With the media's help, the Wayfarer changed how the public perceived eyewear. Audrey Hepburn, James Dean, and Marilyn Monroe performed on the silver screen wearing Wayfarers. 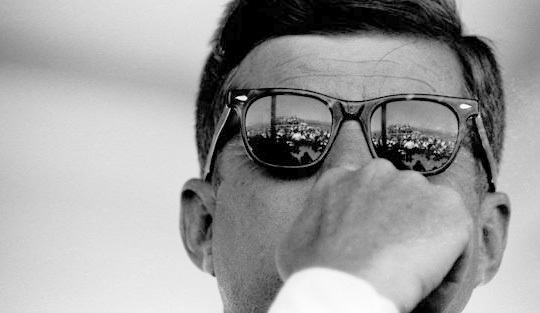 Sunglasses were no longer just eye protection, they became a fashion accessory. 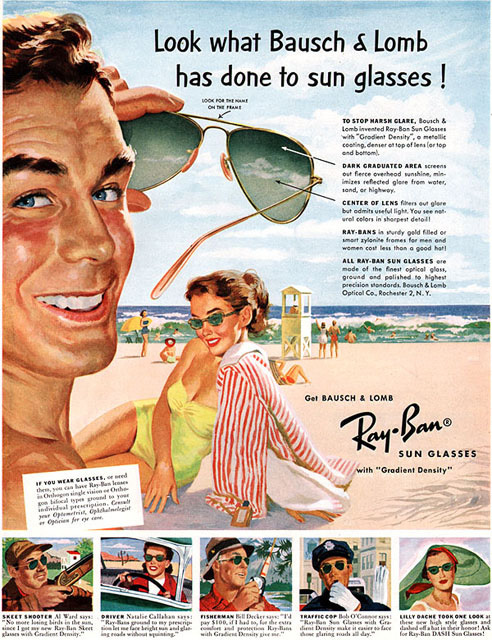 As the glasses rose in popularity Ray-Ban continued to innovate, offering Photochromic lenses treated with a polymer film that darkened when exposed to UV rays. They also released Signet and Caravan frames, and a broad line of eyewear designs for women. The '80s would mark the climax for Ray-Ban. Michael Jackson wore them during his “Bad” tour–the highest attended tour in history. 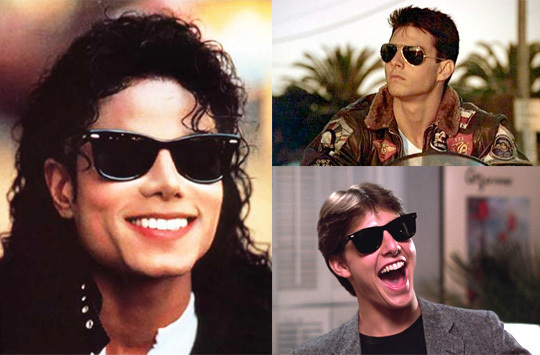 Tom Cruise wore Ray-Bans in some of the most iconic movies of the decade–Top Gun and Risky Business, resulting in a 40% surge in Ray-Ban sales. Ray-Ban lowered their prices and build quality to increase the accessory's accessibility, but the brand soon reached saturation. 1990s America rejected the fashion of the '80s and Ray-Bans were seen by the public as overplayed. 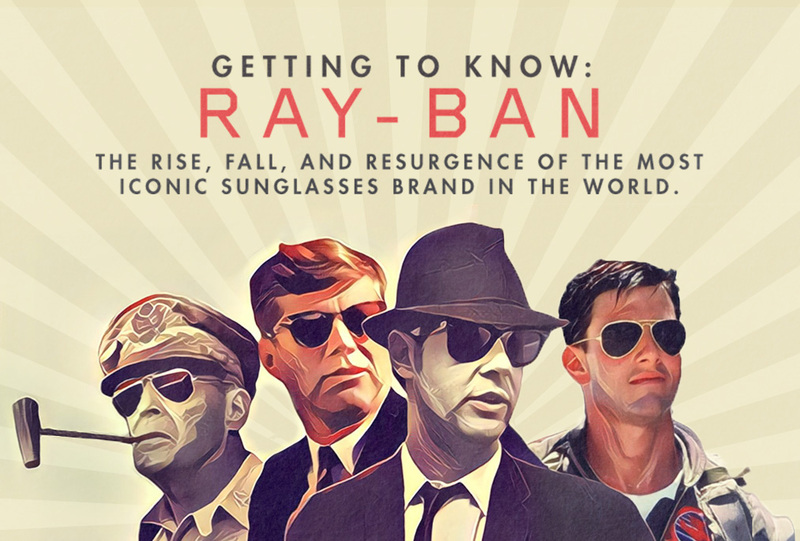 Despite Ray-Ban products appearing in several movies such as Reservoir Dogs and Men in Black, Ray-Ban continued to decline as Oakley took more and more of the sunglasses market. Once a luxury brand, Ray-Bans could be purchased at convenience stores and gas stations. Ray-Ban was dying, and where Bausch and Lomb saw failure, one Italian eyewear company saw opportunity. The now behemoth Luxottica began selling eyeglass frames in 1961 Agordo, Italy. By 1974 its owners realized the need for vertical integration–merging design, manufacture, retail and distribution. In 1999, after many years of growth, Luxottica purchased Ray-Ban and went to work restoring its image. They consolidated production and re-engineered the glasses, introducing durable construction and quality lenses. Ray-Bans were now Italian made. Luxottica removed Ray-Ban products from gas stations and introduced luxury versions to Neiman Marcus and Saks Fifth Avenue. In 1999 Aviators sold for under $20, a decade later they could be found selling for $130 in boutiques. In the 2000s Luxottica began selling Ray-Ban glasses with several new technologies. Polarized lenses reduced the intensity of reflected light by 99%, Oleo Hydrophobic Coating offered water-wicking and easier lens cleaning, and Color Enhancement lenses increased color definition and contrast. Luxottica continued innovation into the 2010s, offering titanium alloy and carbon fiber sunglasses that are both light and durable. In 1999 Aviators sold for under $20, a decade later they could be found selling for $130 in boutiques. Today Ray-Ban is the world's largest, most successful sunglasses brand. Today three styles compose the core of the brand. Metal wire frames rim big, tear-drop lenses that curve in toward the cheekbone. A wire frame offers lightweight construction while the large lenses provide superior eye protection. A top bar reinforces the bridge for enhanced durability. Aviators have soft nose pads and plastic earpieces for comfort. Perhaps the most iconic shape among sunglasses, the Wayfarer has a durable, scratch-resistant plastic frame. In lieu of nose pads, the Wayfarer's bridge is sculpted to fit the nose. The temples have a slotted ear rest and are curved to wrap snugly around the back of the head. The brow of the glasses rise slowly from the bridge to the end-piece which houses a marquise decoration. 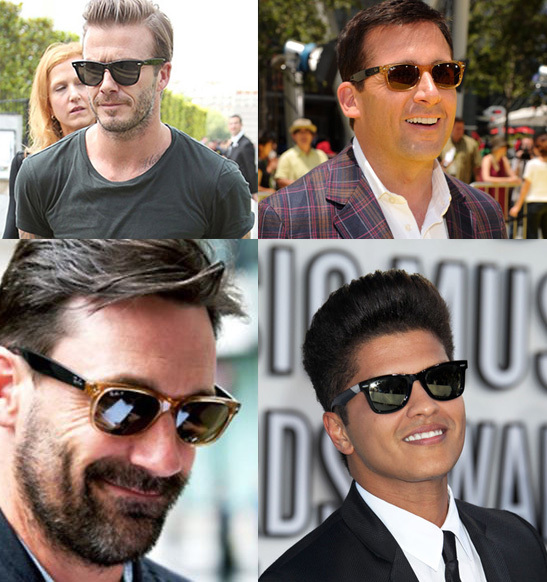 Ray-Ban updated the classic with its “New Wayfarer,” (Shown on Jon Hamm and Steve Carell above) which has a slightly smaller frame and softens the shape. Child of the Aviator and the Wayfarer, the Clubmaster displays a style all its own. 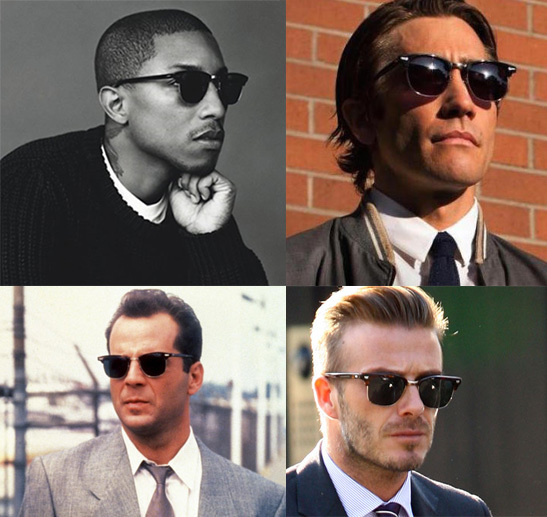 The Clubmaster was based on “browline” sunglasses – originally designed by the Shuron brand – that were incredibly popular throughout 1940s and 60s, including Ray-Ban's trademarked Browline model. The glasses retain a Wayfarer silhouette with plastic brows, while the lenses are framed with an inward-curving metallic underwire and joined by a metal bridge. The glasses have Aviator-style nose pads, Wayfarer-like marquise accents, and thin temples that reach straight back to the ear. 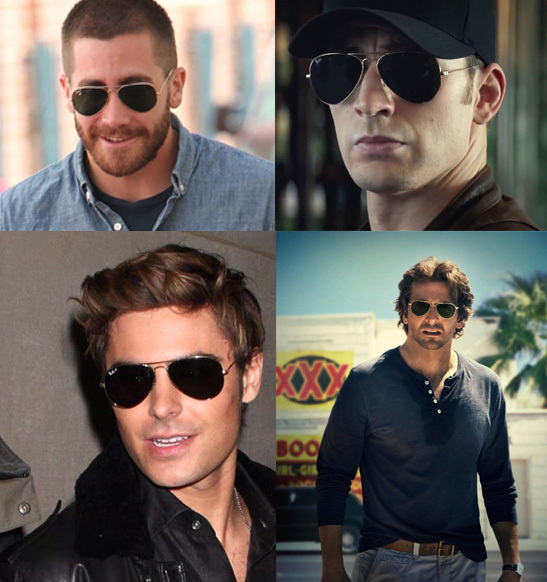 Almost all sunglasses are variations of the 3, which are your favorite? Nicholas Taverna is a style enthusiast, a writer, and a Financial Planner with Royal Alliance Associates. He works out of his office in Port Jefferson, New York and Brooklyn, New York. In his spare time, he also dabbles in tennis and gourmet cooking. At that price? None of them. Ray-Bans have been cheap more than they’ve been expensive in my lifetime and I’ve never owned a pair. I have a pair of polarized AO pilots, I don’t think they’re see through. Thanks Andrew! Have you got the grey lenses? I’ll pick one up, I’ve never really been satisfied with Ray Ban’s for the price. I’ve got nothing against Ray-Ban’s, except for the price. I never owned a pair, because I never liked how they looked on me, but I think they look great on others. I was just saying that I didn’t buy them when they were $10, so I certainly wouldn’t pay $100+ for them. I don’t pay much for any sunglasses, anyway. I mostly just use them for driving and I have a few pairs of Foster Grants that serve me fine. Has anyone had experience tightening the nose prices on the aviators? I’ve got a pair and tried pushing the nose pieces up but they still slide down my face from time to time. They are, I haven’t got a target optical in the U.K but I’ll have a look out for a local opticians and see what I can do. Like Alex said, or most places will charge a few bucks to adjust. Thanks Andrew! I’ll give it a go. I was doubtful of if wayfarers would look right on me and bought a pair of Cheaters first after seeing them time and again on the getups here and loved them for the price (~$8 on amazon polarized). They are also perfect for the lake or somewhere they could be easily lost! Take it from someone who lost a $200 pair of Costa in the water once. Ray Bans are one of the few brands that have styles that fit my large head, so they have my loyalty. I’ve tried WP, AO, and others to no avail. I love the polarized Wayfarers. It took time for me to purchase Ray Ban sunglasses. They didn’t fit my face’s shape well. Thanks to the New Wayfarer I got it in my accessories . I have a pair of mate tortoise polarized and a pair of mate black. I also have to share with my wife a pair of shinny black and transparent new wayfarer. I love the global quality of the new era RayBan sunglasses. I don’t regret the purchase and I still changing with my pairs of Oakley to have a more sporty look. I’ve got a pair of 3025 aviators and was just wondering how they sit? I can’t really gauge how high they should sit on the nose. I AM A UPSCALE MEXICAN BUYING RAY-BANS FROM STAMPER IN THE MISSION FOR THE LAST 30 YEARS. I FORGOT TO MENTION LA MISSION EN SAN FRANCISCO. RB were never $10 or in gas stations. Maybe knockoffs. 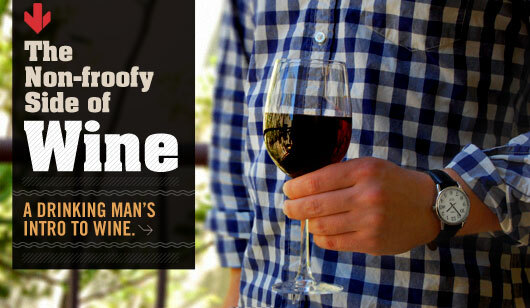 That is a myth story to build brand up. Even With B&L made a kids version – called Covers – they was $40 in the 80s. A lot of the optical coatings by B&L were better quality than Luxottica.